Pass and shoot is a fusion of smart phone technology and real basketball and soccer! Towards the end of 2016 Alfio Bucceri travelled to Barcelona as a shareholder and former consultant of “Funtastic”. 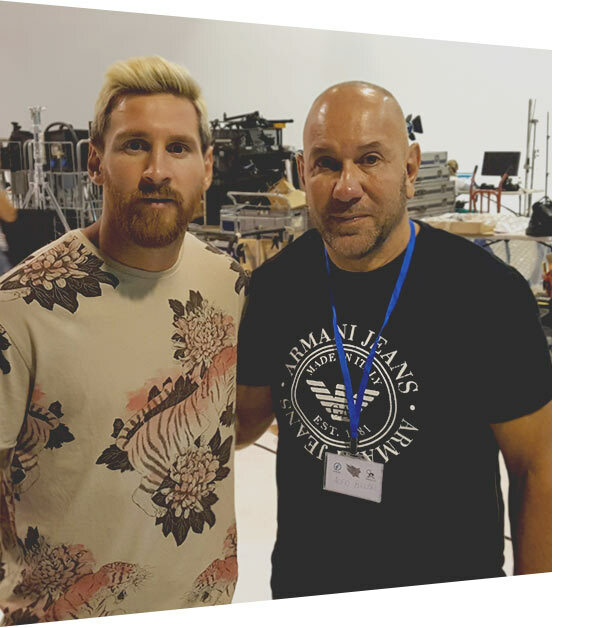 Funtastic is a global producer and distributer of lifestyle products and invited Mr. Bucceri to the Spanish metropolis to meet football superstar Lionel Messi during one of his commercial shoots for the “Messi Training System”. As a true football and basketball enthusiast and passionate inventor, Mr. Bucceri was honoured to meet one of the world’s greatest football players and to see his new line of football training tools and toys. He was immediately intrigued by the action on set. Watching the golden boy of football playing alongside a crowd of excited kids proved fascinating. The children were filled with joy and excitement while playing and even continued their games during breaks when the filming stopped. They would challenge each other to little competitions to see who could score the most goals or hit the targets as accurate as possible. After the video shoot Mr. Bucceri continued his travels to Italy. While waiting for his flight at the airport he noticed the overwhelming number of young children glued to mobile screens. They were playing games, mainly football games, on their phones or mobile devices to keep themselves busy while waiting for their flights. Little fingers were rushing over screens in any direction imaginable and the Pass And Shoot inventor started to wonder what benefit their online gaming skills could give them in a real life football game. He concluded that an exclusively online game will sadly not give them any advantages on the field. As a successful inventor, retired professional football player and former fulltime tennis coach, Mr. Bucceri was well aware of the tools, skills and traits that are needed for a child or adult to succeed in any sport. A strictly online game won’t improve someone’s real life football skills but a hybrid of a real-life football game and an app style training tool could do just that. The idea of Pass And Shoot was born. A football and basketball training tool and game where you use your feet and not just your fingers. A Game where you can combine the feedback and encouragement from an online app with the fun, movement and exercise of a real-life football game. After 12 months of constant development and refinement Pass and Shoot was finally born.